In part I we have built a simple VI that controls a LED, switching it on or off through a virtual pressure button. We will now show step by step how to launch the application in the Internet and control it remotely. 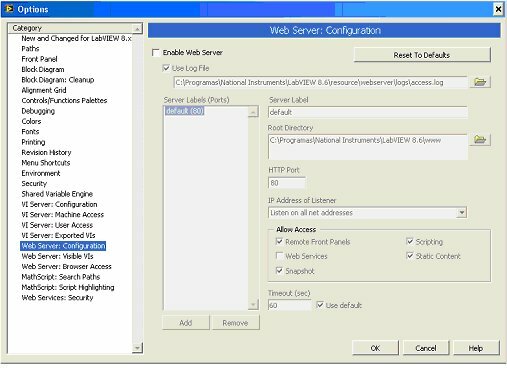 Enable server by clicking in the choice box on the right of the phrase Enable Web Server. 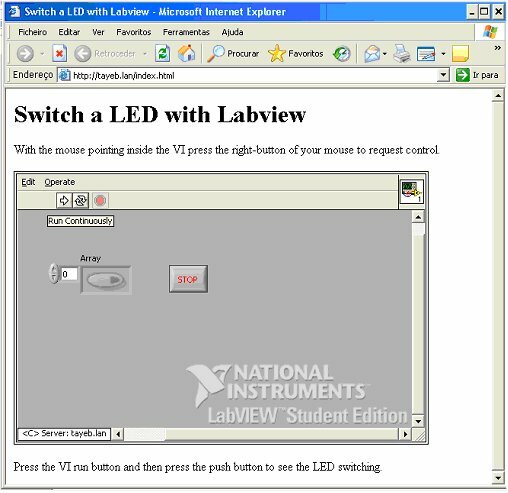 STEP 32 – Knowing the IP of the PC (and better fixing the IP) one ought to be open the Labview’s page on the Internet. If the PC is behind a router, one needs to make the adequate changes in the router, in order toall external demands to the local fixed IP. 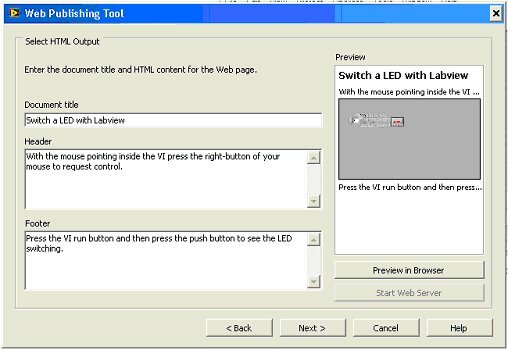 In order to view the LED switiching on and off a webcam setup is required. In order to stream video YAWCAM freeware is advised. Having the requirements mentioned on the YAMCAM website one can easily establish a streaming server. If the PC is behind a router the video streaming server port must be opened on the router. 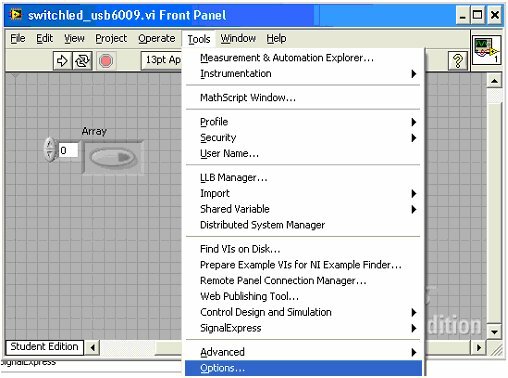 Having designed a VI we have controlled a real world circuit with a virtual button on the VI. 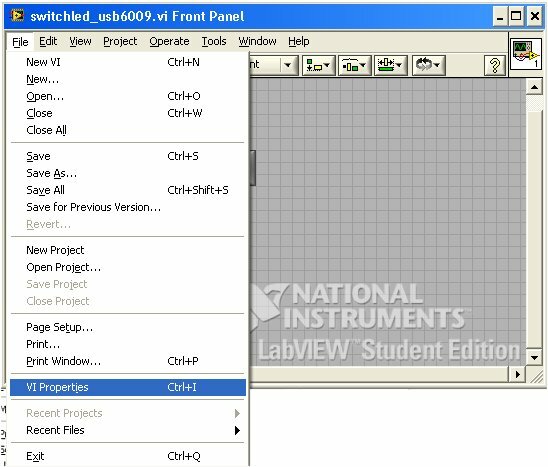 We next have achieved Internet control of the VI using the tools that Labview offers. This entry was posted in Electronic Projects, Internet of Things and tagged DAQ, Internet Control, LED control, NI LabView, USB6009. Bookmark the permalink. thank you very much. this helped me a lot. but i have a question in my mind in step 28 how did we chose the web page’s adress. or did we directly copy our html file to the web page? Can you also add access control to the application? Thanks in advance. Welcome to my blog Ali. 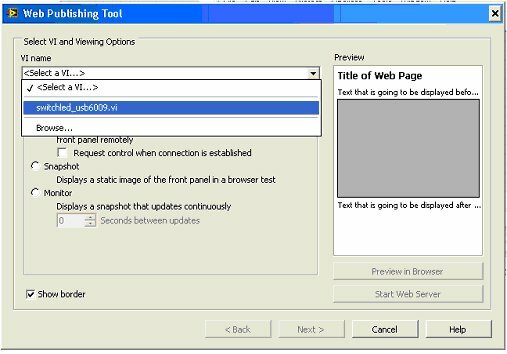 Step27 allows you to give the appropriate name to the webpage. Once you have followed the remainder steps you will have a server functioning in your PC. I hope I have answered. If you feel you are missing something please let me know. Wish you good luck in your project. Thank you very much. I understood it now. your web page really helped me a lot. i hope it will help more people like me. thank you again. have a good day. I’m glad you got it working and undersrtood the steps. If you have online publication of your work, please share it here by indicating the URL. AOA. I am a bit confused. 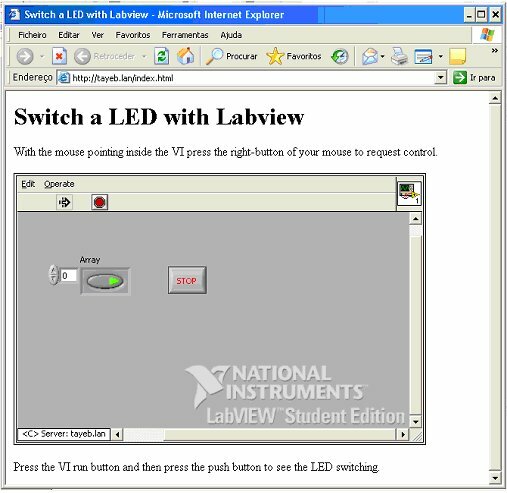 I am using Labview 2010. After step 27 when it gives me the option to save it, it displays localhost:/something in url field. It points to localhost. But i want it to be on a website accessible from anywhere in the world. How can i do it? Welcome to the blog, Kashif. Well, that’s what has to happen. There are in the Internet many examples that explain how to do it. I hope I have removed your doubts. The best way to learn is by doing it. i have created a website and i want it to control from there. how? What do you want to control? The images and description in my tutorial show how to control say a LED. So, really you need to find the manual of your router and Telnet into it and add the ip forwarding. You will need the internal IP of your PC where Labview is running. 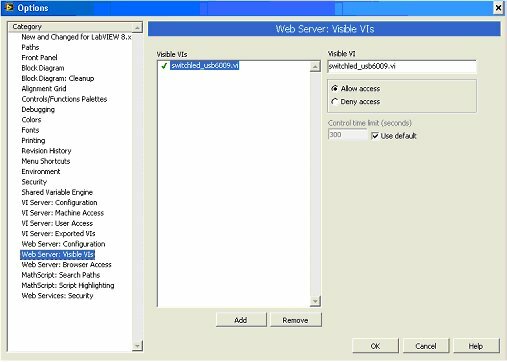 Hi, so..if i create th web serve vi in a PC and it has a fixed IP, then how can i access from a different computer? could you please explain it? Welcome to my blog. You need to check the IP of the PC with the application. You will find the service with IP instead of localhost. I think this seems to be the problem. That’s a bit outdated now. 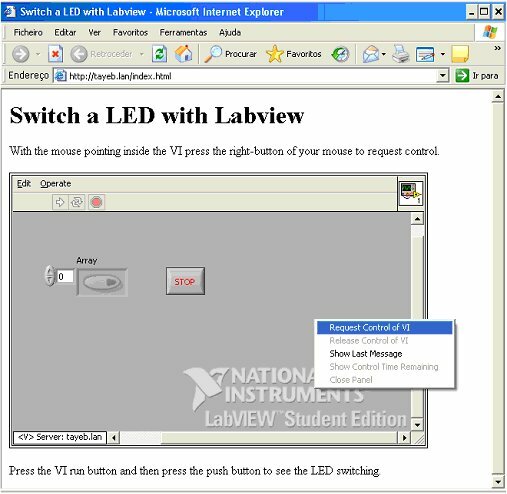 Have a look at WebPager plugin for LabVIEW (https://labicom.net/labdeveloper/WebPager/). It allows to put front panels into web browser in a much simpler and cleaner way. Moreover, with WebPager you don’t have to install any plugins or run-time engines. Also, it will consume less traffic and there are lots of other advantages – you can read about them on the web site. Welcome to my blog. Quite interesting though again it is a plugin. I will try out. 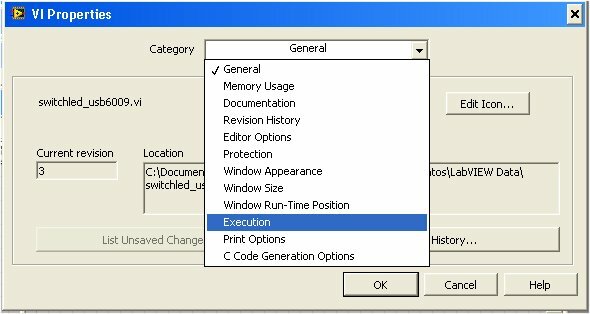 One question: Can I control application from another computer now? 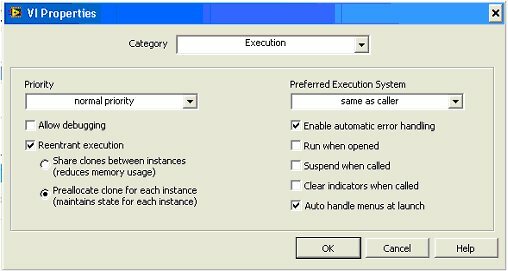 If I don’t, what I need to do to control from another computer? Welcome to my blog Miha. Yes you can, you need a plugin. Please read through the tutorial. Page is launched as http://localhost. 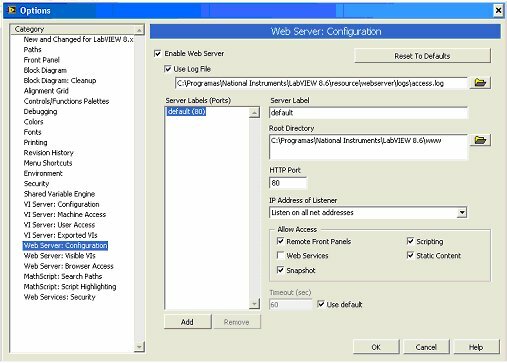 With IP forwarding in your router you can also access the page externally. It is beyond the aims of tutorial external web access, but there is plentiful of information on the Web, on how to do it, including addressing the issue of dynamic IP, with services available, at little, or no cost. No idea. Have you folowed the steps correctly? 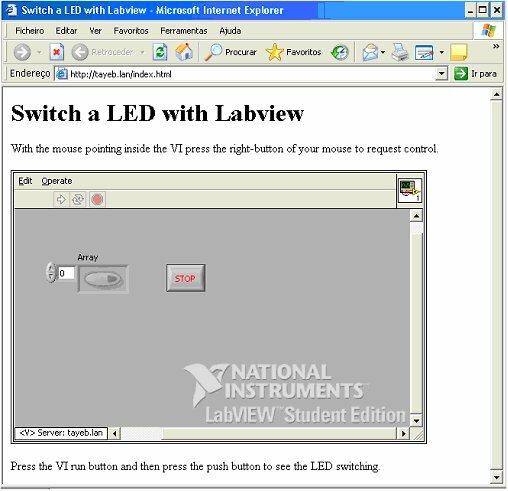 ok i repeated the steps it work thank you a lot ,,it is a nice idea i want to build it as project for my labview course ,,,one more question can i access from outside not only from the same network ? 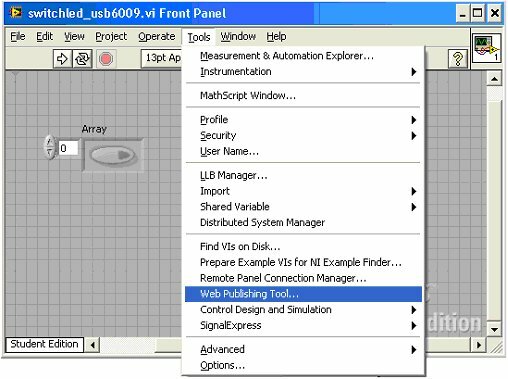 how do i publish my VI using web publishing tools on my web page? To get on Web you need IP forwarding on your router and an IP service. I do not know if that is your question.